Submitted by joemanning on Fri, 01/01/2016 - 11:52am. This is Joe Manning, of the Lewis Hine Project. I interviewed one of Isaac's daughters. I now have his interesting, but brief story on my website. Submitted by Anonymous Tipster on Mon, 08/27/2007 - 11:29pm. I'm going to start playing a Shorpy drinking game and down a shot any time somebody grumbles about "kids today." Assuming my liver is up to it. Submitted by Anonymous Tipster on Sat, 08/25/2007 - 5:09am. You're right...now 12 year olds deliver crack cocaine instead of messages. Submitted by LC2 on Fri, 08/24/2007 - 7:22pm. The "good" old days. As bad as some things are now, at least we have very few 12 year olds spending all their time running messages for ladies of loose morals to their johns. Submitted by robcat2075 on Sun, 08/19/2007 - 11:36am. 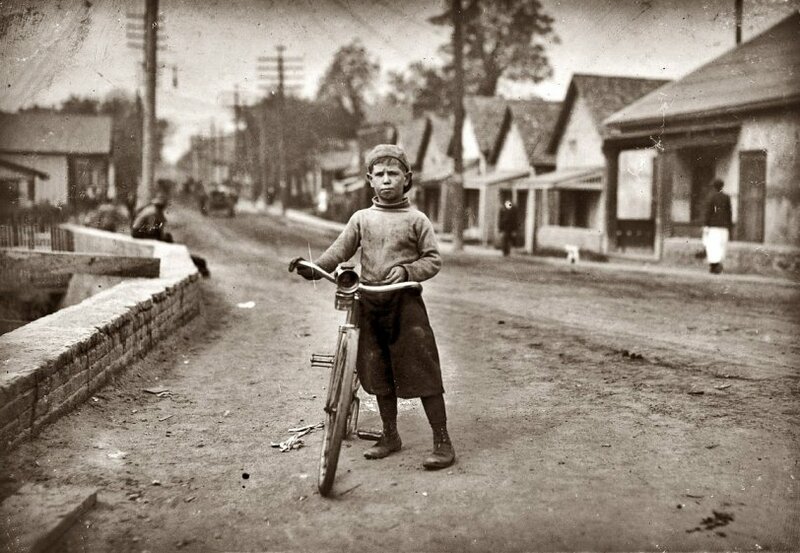 Ok, how does a 1913 photo demonstrate child abuse "today"? As far as child labor goes, I'd say riding a bicycle around and delivering six messages a day is WAY better than some of the coal mining and factory situations we've seen here. And I bet half the reason he's grimacing is that he's facing into the sun. Submitted by Anonymous Tipster on Sun, 08/19/2007 - 10:15am. This photo illustrates the failure of capitailism and the abuse of children that continues today in the USA. This child should be at home, playing and enjoying childhood while he can. Submitted by Denny on Sat, 08/18/2007 - 4:58pm. Peter Card has a richly detailed web site on early bicycle lamps. See the page, especially, on oil (kerosene) lamps, which I think is the type Master Boyett is sporting on his handlebars in this Hines photo. Agree: this young lad does have world-weary, seen-it-all eyes. Submitted by Varooka on Fri, 08/17/2007 - 8:53pm. I love the look on this boy's face, and his world-weary eyes. Submitted by Dave on Fri, 08/17/2007 - 8:08pm. It looks like one of the kerosene lamps below. Esp. the "Jim Dandy." Submitted by PhilipQ on Fri, 08/17/2007 - 7:53pm. 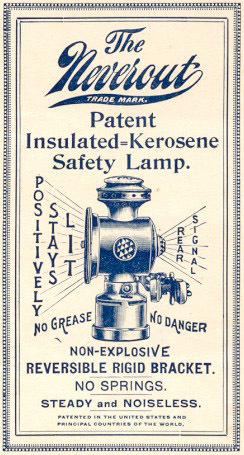 Are you sure of it being a kerosene lamp? Looks like a carbide light like miners used to me. Submitted by Anonymous Tipster on Fri, 08/17/2007 - 6:37pm. Probably not many bicycles today have kerosene lanterns on the handlebars. Fascinating. Submitted by Ron on Fri, 08/17/2007 - 4:09pm. I would bet that this kid gave the money to his mom, who probably had 6 or 7 kids to feed. Submitted by Anonymous Tipster on Fri, 08/17/2007 - 2:53pm. Eight dollars per week in 1913 is the equivalent of about $160 today. About $8500 per year. Not bad for a 12-year-old.